For example, filmmakers had to remove any reference to Darwin from the horror film Dr. Renault’s Secret to avoid offending religious people. The [Production Code Administration’s] judgment on the film reads: “The story is based on theories of human origin in such a way that, if presented to the public, will undoubtedly offend the sensibilities of large groups of religious people of different faiths, and accordingly, could not be approved under the provisions of the code.” Of course, such a judgment would have killed the film’s commercial value so after consultation with the executive producers and the studio executives: “It was agreed to eliminate any reference to Darwin or to his theory, and to establish the ape as a throwback." Those currently fighting to keep religion out of the science classroom should take small comfort in the fact that at least Darwin and evolutionary theory is no longer considered to be too shocking to even be mentioned on screen. But what if Darwin's opponents had succeeded in quashing the inclusion of evolutionary theory into the framework of the biological sciences? It's a bit hard for me to imagine, since the modern synthesis of genetics and evolution is so fundamental to our current understanding of biology. But imagining bioscience without Darwin is what SF author Ted Kosmatka - a self-described "laboratory research drone" - has done in his novelette "The Prophet of Flores". "Carlson, can you tell us in what year Darwin wrote On the Origin of Species?" "Yes, and in what year did Darwin's theory finaly lose the confidence of the larger scientific community?" "That was 1932," Anticipating this net question, Paul continued, "When Kohlhorster inventerd potassium-argon dating. The new dating method prove the earth wasn't as old as the evolutionists though." "And in what year was the theory of evolution fianlly debuned completely?" "1954, when Willard F. Libby invented carbon-14 dating at the University of Chicago. He won the Nobel prize in 1960 when he uswed carbon dating to prove, once and for all, that the Earth was 5,800 years old." Now, in our world, Willard F. Libby did indeed win the 1960 Nobel Prize in Chemistry for his development of carbon-14 dating, but despite the arguments of the creationists, it did not prove the earth was young. Also as in our world, the remains of tiny humans were discovered on the the Indonesian island of Flores. Study of Flores man - popularly nicknamed "Hobbits" - indicate that they are a new hominin species, Homo floresiensis. In the context of evolutionary theory, they are an interesting branch on the human family tree. In the absence of the framework of evolution they instead provoke a crisis of faith. It's an excellent story, well worth reading (or listening to). Listen to "The Prophet of Flores" on StarShipSofa. You can learn more about Homo floresiensis by watching the Nova program "Alien From Earth" (free online) or, if you are interested in more technical details, Nature's Flores man special issue (videos are free, most of the rest subscription only). 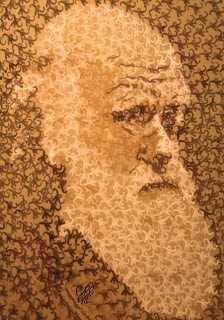 Top Image: Artist Pure Evil's image of Charles Darwin made up of little monkeys (via Don't Panic Online). 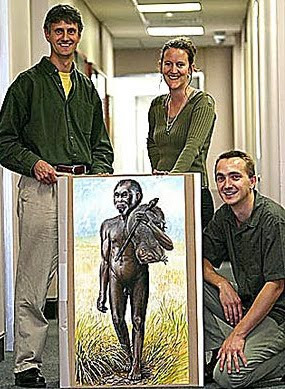 Bottom Image: University of Wollongong scientists with a life-sized portrait of Homo floresiensis. You can read the first chapter of Hell's Aquarium here.